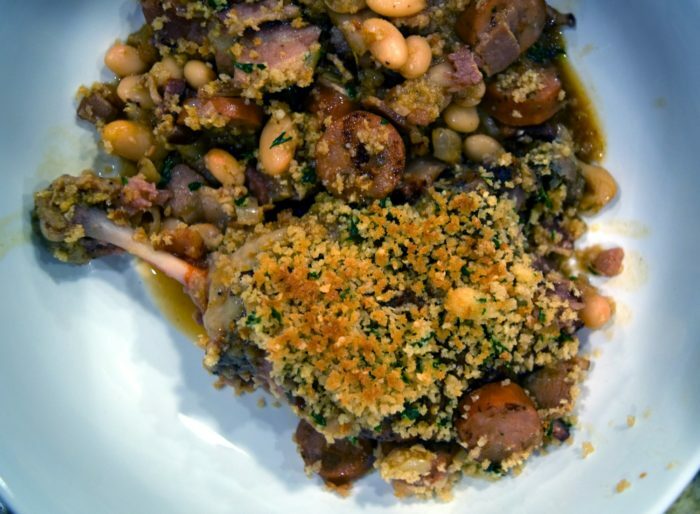 I used to make cassoulet in my Le Cruset, which was an all-day affair even when I used pre-cooked confit duck. 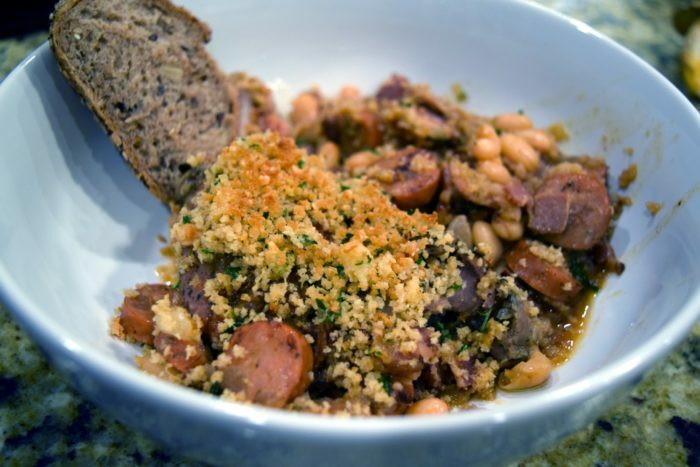 This Instant Pot Cassoulet quickens everything and still tastes like it simmered all day. This is finished in the oven to crisp up the Panko topping, although you can omit that if you lack an oven or toaster oven. 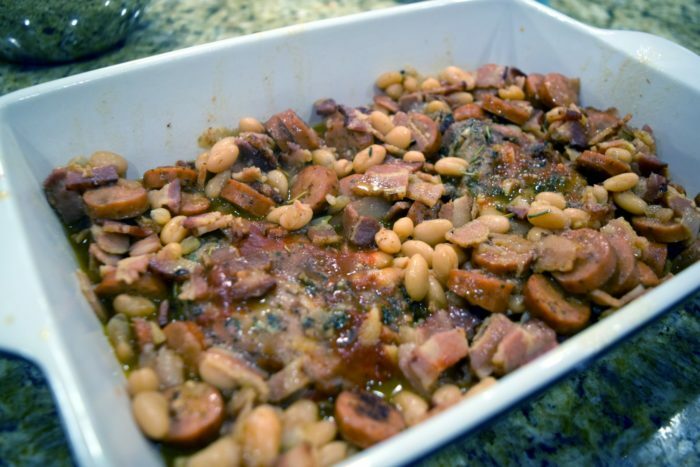 You can learn more about traditional cassoulet here. This recipe is for two duck legs, but can feed 3-4 people if you shred the legs. However, for 4 people, I recommend simply doubling the recipe so that each can be served a whole leg. Cooking time remains the same if you do so. You do not need to double the topping amount for a double recipe. I already use a large amount for the recipe as written. 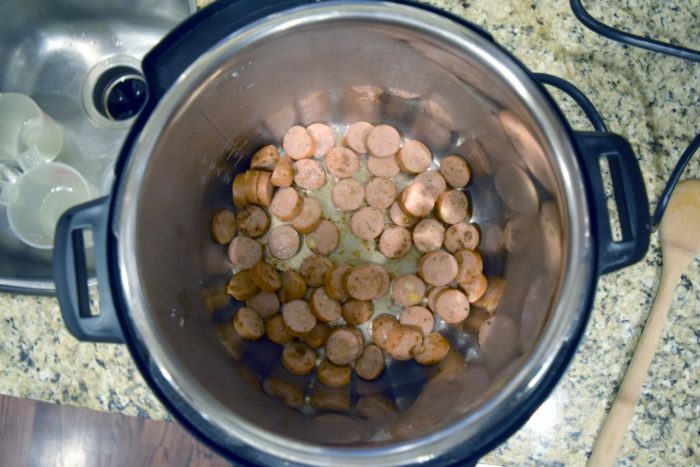 The key to making a quicker Instant Pot Cassoulet to use canned beans and precooked sausage and duck confit legs (I find these in the frozen meat section at the grocery store). 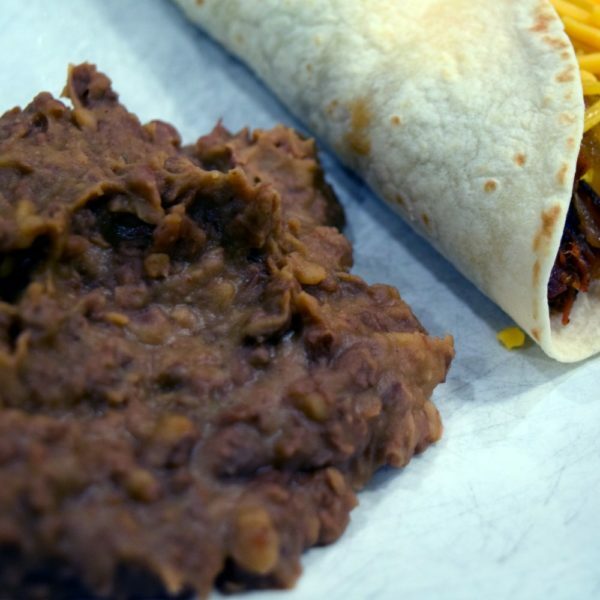 You can use dried beans, but that will increase your cooking time by a large amount. I included timing for that, but this recipe is tested with canned beans. I love using Gilbert’s Bourbon Apple sausage. Can’t find or don’t like duck? 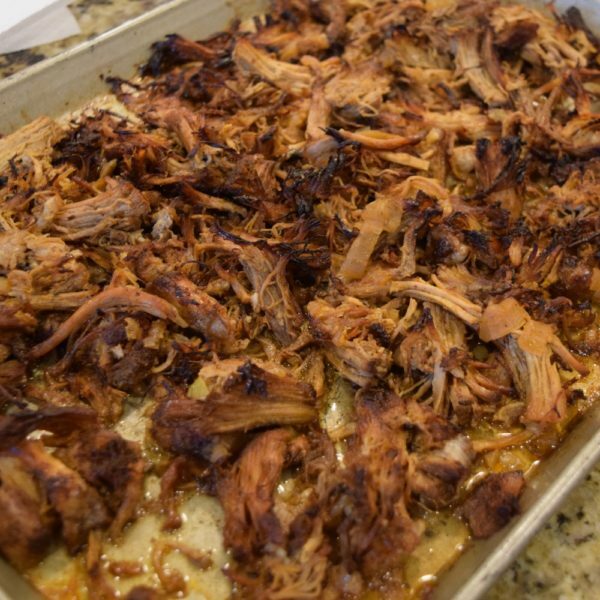 You an use shredded rotisserie chicken instead, or use raw chicken thighs and increase the cooking time to 20 minutes. Start out by browning the sausage. Let it get nicely browned, then add in bacon or pancetta (I usually use bacon), some diced shallot, and garlic. 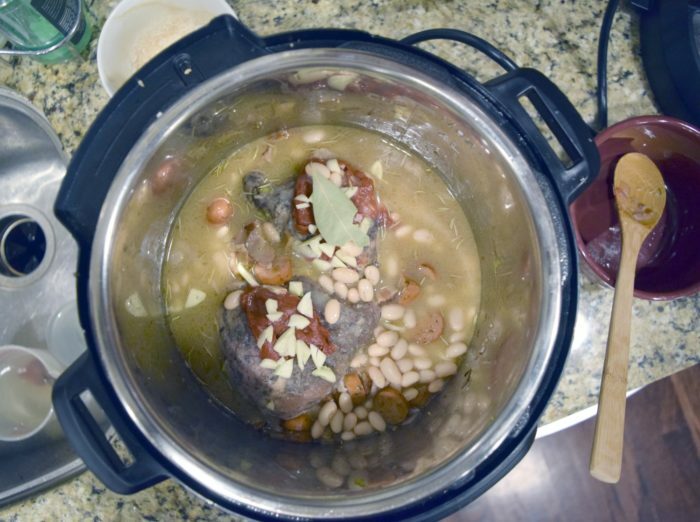 Once everything is nicely browned, pour in the beans and broth, add the spices, and give it a stir. I add a bit of Better than Bullion to my broth to increase the flavor a bit. Just a teaspoon will do. Put the duck legs on top. You want the duck fat from the pouch in there too! Then, spread some tomato paste on top and float in a bay leaf. Pressure cook for 8 minutes and quick release. While it is cooking, mix up the topping and preheat the oven to 450, or preheat your broiler. Transfer the Instant Pot Cassoulet to a baking dish, add the topping, and brown it up in the oven or under the broiler. The topping really adds to the dish! I like to serve the Instant Pot duck and sausage cassoulet in bowls. Each bowl gets a confit duck leg with some of the cassoulet bean and sausage mix, with a nice bit of topping. 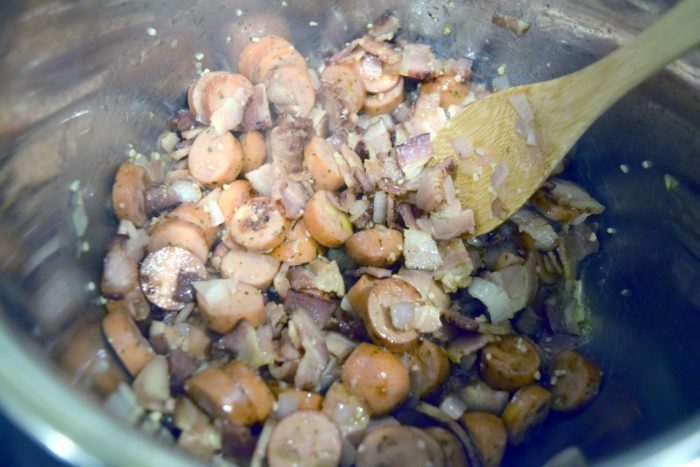 It is great to serve this with a crusty Italian or French bread to soak up the juices. This is a great winter comfort food and is very hearty. It doesn’t take a lot of it to fill a person up. Enjoy! 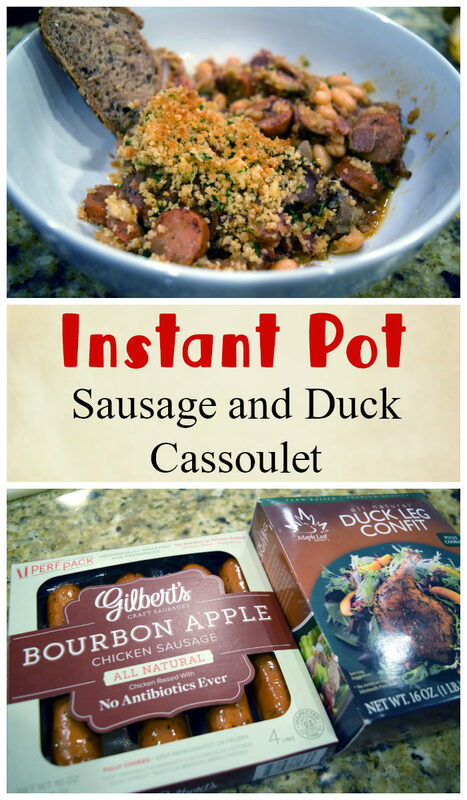 Instant Pot Duck and Sausage Cassoulet. This French comfort food is made easy and quicker by using precooked duck confit legs with beans and sausage in the Instant Post. Set Instant Pot to Sauté mode and add the olive oil. Add the sliced sausage and brown it, about 5 minutes. Add the butter, bacon or pancetta, and shallot. Sauté for 5 minutes or until cooked. Add the broth, deglazing any brown bits from the bottom of the pot. Add the beans, thyme, parsely, salt, and pepper, and stir. Place the duck legs and garlic slices in the pot. Add 1 T tomato paste to the top of each duck leg. While the Cassoulet is cooking, prepare the topping. Mix the Panko, Parmesan, and Parsely. Preheat oven to 450 or preheat the broiler. 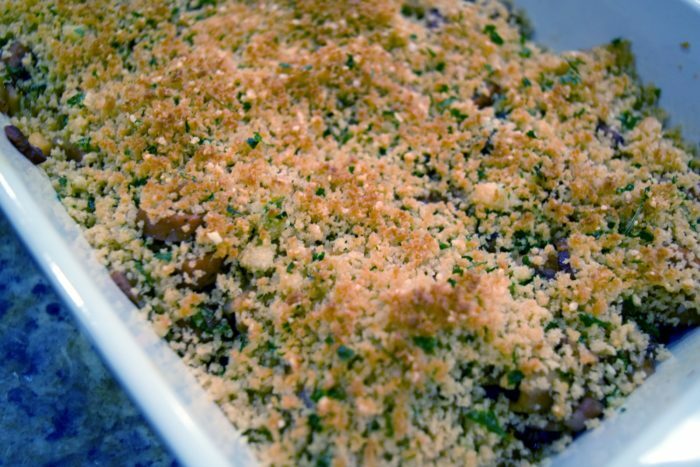 Remove the Cassoulet to a baking dish and spread the topping over it.